As your dog gets older, he will become more dependent on you. Therefore, an extra layer of TLC can make all the difference, helping to keep your dog happy, comfortable, and safe. Here are five ways to care for your older dog. As your dog enters his senior years, it’s important that you take regular trips to the vet. Getting a check-up on your dog will give you peace of mind and ensure there is nothing wrong. Your vet can perform regular tests and exams to catch any issues, as well as give you advice on diet, exercise, and other changes you can make to ensure your dog is happy and healthy. Building a good rapport with your vet can be incredibly beneficial, helping you to feel comfortable and relaxed when you bring your dog in. Make sure to purchase dog food that is specifically tailored towards older dogs. To do this, you can look at the packaging where you can straight away identify whether it’s right for your dog. One of the main health concerns in senior dogs is obesity, so make sure to monitor your pet’s diet to ensure he stays at a healthy weight. As he gets older, your dog may start to lose interest in his meals, so try and feed him smaller amounts several times a day. This will not only help control his weight, but it’s easier on the digestive system too. If your dog can’t get around like he used to, that doesn’t mean he won’t enjoy going out for walks. Factoring in moderate exercise each day can keep your dog active, but it’s important that you know his limitations. Senior dogs can tire much quicker, so you should listen to your dog if he seems in distress or wants to go home. Regular exercise can also promote healthy bones, muscles, and joints. You will want your dog to feel as his safest in your home. Therefore, ensure that his food, toys, water, and bed are in places that are easy to access. Many older dogs suffer from mobility issues, so it’s best to keep all his necessities close by. If your dog has serious mobility issues, you may want to consider purchasing a wheelchair for your dog to help him get around. Companies like K9 Carts have been mobility experts since 1961, providing dogs with fully adjustable and patented wheelchairs for over 40 years. To give you reassurance, you should examine your dog a few times a week to ensure they are healthy and happy. Make sure to check your dog’s eyes, ears, and nose for any discharge or discoloration. Also check his head, stomach, limbs, and neck for any unusual growths or lumps. Senior dogs may have trouble with their breathing, so make sure to listen out for any coughing or wheezing. 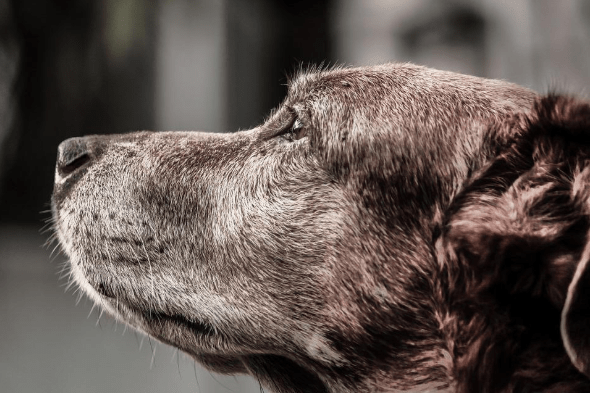 Taking regular trips to the vet, feeding your dog a well-balanced diet as well as giving your pooch moderate exercise are just a few ways to help him live out his final years in comfort. Try and make your home as risk-free as you can to ensure your dog is out of any danger too.